On Christmas Day, 1932, Doyle Johnson of Temple was taking a nap after the family Christmas dinner when he was awakened by his wife saying that some individuals were trying to steal his new car, parked outside. Mrs. Johnson yelled for them to stop as Doyle ran to the car, jumped on the running board and struggled with the thief, Clyde Barrow, who fatally shot him. Bonnie Parker, Barrow and W. D. Jones escaped with the stolen car. The following year, another Barrow associate, Frank Hardy of Waco was identified in a photo lineup as being Johnson’s assailant. Hardy was indicted by a Bell County grand jury and the case went to trial the following November. Hardy swore his innocence, stating that he had been in Waco that entire day. The jury was unable to reach a verdict and the judge declared a mistrial. Before the case could again be brought to trial, Bell County officials were notified by police in Dallas that W. D. Jones had been arrested on another matter but had implicated Clyde Barrow as the shooter in the Johnson case. Bell County officials released Hardy on bond. Clyde Barrow reportedly typed a note that was never mailed to authorities exonerating Hardy from the Johnson killing. It remained in the Barrow family collection until it was sold at auction years later. The Waco Tribune-Herald reported Hardy’s death in its January 31, 1967 edition, stating that he died at 8:15 AM the previous day of a heart attack at age 58. Hardy had spent much of his adult life in and out of prisons. He was born and raised on Bell’s Hill in the south central part of Waco. He was a member of the “Cotton Palace Gang” which referred to teenagers who used to frequent the old Cotton Palace in their neighborhood for sports and other activities. The obituary went on to say that he had been incarcerated in Texas and Missouri for bank robbery, robbery with firearms and burglary of safes. In the latter case, his specialty was to haul the safe to a remote location and open it by breaking onto it from the bottom, because it was the weakest part. 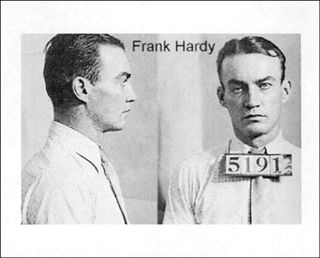 Hardy’s Missouri stint was to serve part of a 25 year sentence for robbing a bank in Joplin. The crew escaped in a car riddled with bullet holes and when they counted their take it was less than $150. Hardy had spent many years committing crimes and serving time in various prison systems. When he was released from jail the last time in 1958 a newspaper article added up that Hardy had served about 25 years of sentences totaling 38 1/2 years. In 1930, his wife and child were picked up in a successful attempt to get him to surrender to authorities, who were seeking him in connection with burglary and automobile theft. The obituary went on to say that Hardy lived by a code of his own and as far as was known, he never brought bodily harm to anyone and often worked with the police to clear up details of the crimes and return the remaining proceeds of the crimes to the rightful owners. The article concluded that Hardy was a model prisoner and earned time off for good behavior. On his death certificate, his occupation was listed as a baker for the Weston Biscuit Co. of Waco. Hardy was laid to rest in Rosemound Cemetery in Waco, Texas.